Happy New Year! Hard to believe it is 2018! Over the holiday break we started doing a pretty serious decluttering project at home. We have some major renovations coming up later this year, and in preparation for that we have to get organized. This feels like a daunting task, but a colleague recommended we read Marie Kondo’s book, The Life-Changing Magic of Tidying Up. Of course, I had heard of it (references to it pop up everywhere and parodies abound! ), but I had dismissed it without even looking at it. “Nah, not for me!” I thought. But the colleague who recommended we take a look at this book is someone who I really respect and, not coincidentally, someone who has a beautiful home, the kind you feel instantly peaceful in. So, we gave it a go. I’m not going to say that I’m 100% sold on every single point in the book, but she does make some really good, thought-provoking points. The end result is that I’m looking at the things in my home with a very different set of lenses now — “Do I really need this?” “Why am I keeping this?” “Why do we even have this?” As we gear up for our renovation project this is a good thing. Today was the first day back to work after the holiday break and I guess I brought those lenses with me to the office today. I opened my door and instantly thought – “oh my gosh. This place needs a good decluttering!” I have a lot of work to do — the start of term is always busy! — but I just couldn’t even focus because of all the piles and piles of stuff everywhere! I was itching to get to the decluttering. So, I have spent the day alternating between my “to do” list and getting my office cleaned up. I feel like it is helping me think clearer and to get my mind around the upcoming semester. For me, the biggest barrier to a clutter-free office are the piles and piles of books I have accumulated over the years. Like most academics, I love books. I love reading them, touching them, looking at them, flipping through them, sharing them, talking about them, etc. Books are so much a part of my identity that I feel weird if I’m not surrounded by them. I had a relative come visit me not long after I had moved to this city, and on that trip he asked to see my new office. I took him there, but I warned him it was messy as I hadn’t really unpacked yet. When he walked in he saw my almost bare bookshelves (remember, I hadn’t finished unpacking!) and said “you need more books! You can’t be a professor with bare bookshelves!” I know it was meant in jest, but I have to tell you – it hurt! I was an unsure new graduate already wondering if I could make it in academia and here was a relative was telling me I didn’t fit the mould! While my current collection of books is not exactly a direct response to that comment, I can’t help thinking of it time and time again when I pile yet another stack of books on the floor of my office because I’ve run out of bookcase space. Today as I sort through my books I have found many that I simply don’t have a use for. In some cases they are the free textbook samples that publishers keep sending me. In other cases, however, they are books that I felt I “should” have when I was a grad student and junior scholar — key texts that everyone kept telling me I should read, but that just didn’t hold my interest. Of course on my shelves there are also several key texts in my fields (and sub-fields) that are completely dog-eared, marked up, etc., but I’m not going to lie — some of the “must have” books just don’t do it for me. Years ago I would beat myself up over this — “I need to read these,” I would think, so they would stay on my shelves taking up space. Now, however, as I purge and weed my shelves to make room for the piles of books that I genuinely want to be reading I’ve decided “enough is enough.” I have enough confidence in my scholarship and research now to know which books I actually should read and which can be sent over to the used bookstore. I hope their new owners find joy in them! My term as Department Chair came to an end on June 30th and since then I have been knee-deep in writing/research. I didn’t get as much done on the book manuscript as I had hoped while being Chair. (Surprise, surprise!) This was very frustrating, but I have spent too much time feeling awful about how behind I am. Onwards and upwards. So, now I’m pulling up old files and documents. I have been trying to get my head back in the game, trying to remember what I was thinking when I wrote certain sections (in some cases many months or, gulp, even years ago!). I am forcing myself to go back to an old habit I picked up in grad school, free writing. It works. It always amazes me just how effective this is for writing. The trick is to keep up the habit – right now I am still at 15 minutes each session, but I don’t always get around to doing it each day. I’ve also made sure to set aside some time to read fiction, one of my favourite summertime pursuits. Right now I’m enjoying Donna Tartt’s most recent book, The Goldfinch. I’m not that far in to it yet, but so far I love it! 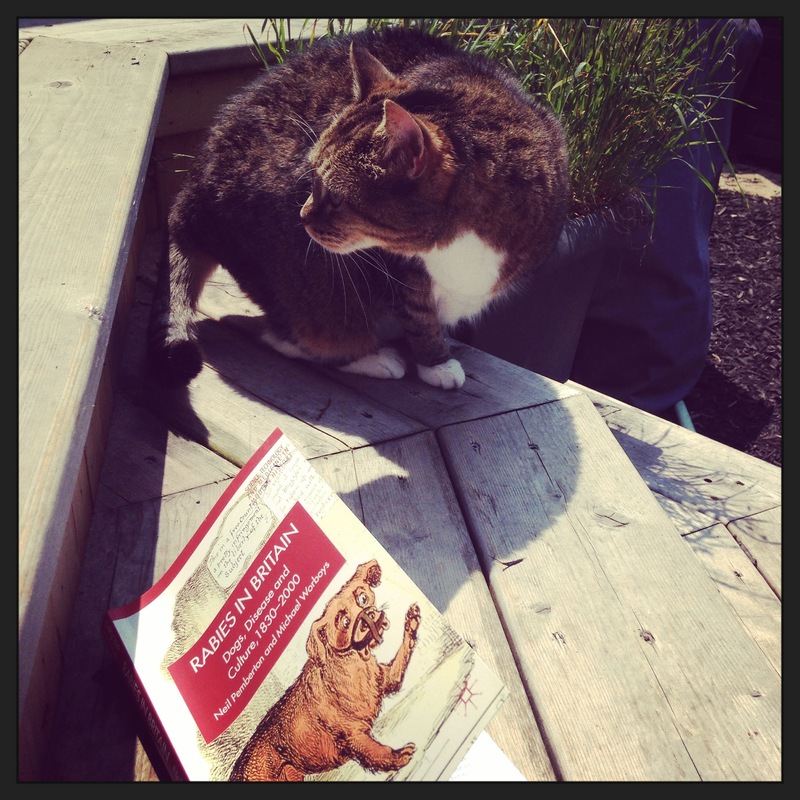 Summertime reading – Miss Jenny isn’t sure what to make of this book. After many years and many rounds of revisions, my book has finally been published. I can’t wait until this crazy end-of-term pace comes to an end and I actually have time to look at it! A colleague recently introduced me to the world of academic mysteries. I’d encountered some of these books from time to time before but had not really stopped to consider that there might be a whole sub-genre of sleuthing profs out there. I began with Joanne Dobson’s Karen Pelletier mysteries, but apparently there are many, many more out there just waiting to be devoured. 1)Last Friday I attended the Medieval Documents Symposium at Brock. This event was to celebrate the recent discoveries of some medieval documents in our Special Collections as well as some donations of documents to the university. My own area of research is the late 19th C/early 20th C, so it was a real treat to learn about an era so far removed from the one I spend all my time studying. This was a truly fascinating event. First of all, I’m always a little in awe when in the presence of material objects that have survived this long. It kinds of blows my mind! Secondly, the presentations made last Friday really embodied a spirit of interdisciplinary inquiry that I find especially engaging. For example, we heard from some of the folks involved in the DEEDS project at U of T. As I understand it, this is a piece of software that can calculate the approximate age of an undated Medieval charter based on the patterns of language that appear in that document. Very, very cool! 3)This week we had Erika Ritter come to campus to talk about her book, The Dog by the Cradle, The Serpent Beneath: Some Paradoxes of Human-Animal Relationships. This is an amazing book that really delves into the many complexities of human relationships with nonhuman animals, both in our current era and in the past. The event on Tuesday included a lecture but also a discussion where most people in the room had an opportunity to ask questions or offer comments about the multitude of paradoxes that seem to define human-nonhuman relationships. It was a wonderful event, and I left campus that day feeling very energized and couldn’t wait to get back to work on my new research, a topic which is very much related to the themes explored in this book. 4)Tomorrow evening brings another animal-themed event, this time a book launch and fund-raiser. The book being launched is John Sorenson’s book, Ape (from the Reaktion series, Animal), and the funds are being raised for the Story Book Farm Primate Sanctuary. All this *AND* talk of a cross-lake ferry service between Toronto and St. Catharines makes it a pretty exciting week to be living in Niagara! When I fly I often play a little game. I don’t pack a book in my carry-on bag but, instead, wait to see what I can find for reading material at the airport shops. I know, I know — for a book-a-holic this sounds like a risky approach to travel. The fun part, however, is that by doing this I’ve often come across books I wouldn’t think to look for in larger, more diverse bookstores. And for all the flying I’ve done in the past few years there was only one time where I just couldn’t bring myself to buy any of the books for sale in the airport. On my recent trip to Boston I played this game and bought a book at the Buffalo airport. I bought Lisa Genova’s debut novel, Still Alice. I’m not sure if it was the striking cover design or the fact that the book was set in the location I was about to visit, but something made this book jump out at me from all of the others that day. I hadn’t heard of this book before and, like all books bought while playing the airport book game, I had no idea if it would be a waste of money and time or not. As it turned out, I really liked this book. I finished it a few days ago and am still thinking about it (always a sign of a good book!). I don’t want to give away too much, but the novel is about a Harvard professor who is diagnosed with early-onset Alzheimer’s disease. While, of course, this subject matter means that the book does have some heart-breaking scenes, the story is not as bleak or depressing as it might first sound. In fact, I found myself looking forward to getting back to the book each evening as I wanted to know more about the characters and how they were learning to live with this major change in their lives. Quite a compelling read! The other night we went to hear Roch Carrier speak. I have been a fan of “The Hockey Sweater” since I was a kid, but this was the first time I had heard him give a presentation. It was a great evening — Mr. Carrier is such an interesting and engaging person, and I really enjoyed listening to him talk about his career as a writer. He also read some of his short stories to us, including one about how he learned to read. I was particularly touched by this story, given how the words he has written have undoubtedly inspired many other young Canadians to fall in love with reading. I know I certainly remember how I enjoyed reading excerpts of his stories in our grade school readers. I have some recollection of when I first learned to read. My mom tells me that I taught myself, but I’m sure that isn’t entirely true given how frequently we were read to. I do remember wanting so desperately to be able to read like the grown-ups around me, and I’d often sit with a book open in my lap, staring at the pages in the hopes that something magical would happen and I’d start to comprehend what I was seeing in front of me. My aunt Irene bought me a book at a garage sale to practice with. 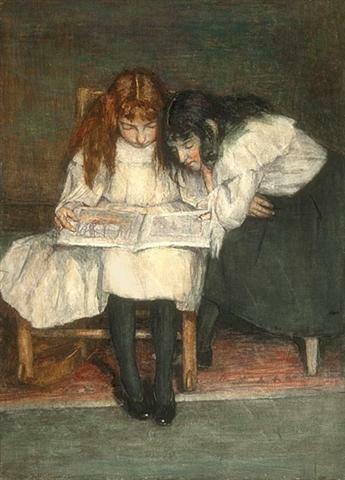 I don’t recall what book it was, but I do remember it was a green hard-backed book and I remember sitting with her, circling in pencil the words I knew how to sound out. After that the details get a bit blurry, but I know that once I figured it out I wanted to read any books I could get my hands on. Ramona Quimby, Laura Ingalls and Nancy Drew soon became close, personal friends. Trips to the public library were much anticipated, and to this day the crinkly sound of a laminated library book cover makes me smile. Of course I continue to read a lot now, but the majority of the reading I do for work is non-fiction. I love the subjects I teach and research, so I do very much enjoy reading books on the history of art, visual culture, botanical illustration, etc., however Mr. Carrier’s talk made me realize how much I miss the pleasure of being carried away by a good story. This summer I’m going to be sure to add some fiction to my reading list!